Kellogg’s recently introduced three new products! Unfortunately none were available at the store in our local town (think extremely small selection! ), but I was able to pick up all three at the Sobey’s a couple towns over. Try these creamy smooth protein shakes first thing in the morning. They contain 10 grams of protein and have 12 essential nutrients in one serving. Available in packs of four and in three flavours: vanilla, chocolate and strawberry. I handed these to John to try since I’m limiting the amount of sugar I consume. He tried the vanilla and said they were good and took the edge off his hunger. I remember living on Eggo waffles when I was a kid. They were quick and easy and something a kid could make! Eggo Minis are the same delicious taste but with a new design. They are separated into four mini squares that look like toast so that kids can easily break apart and eat. They come in two flavours: Original and Cinnamon Toast. Both John and Bridget enjoyed them although John said he wished they were bigger. I told him they are more for kids. Mmm breakfast sandwiches…one of my fave ways to start the day! They come in three varieties: Egg, Ham & Pepper Jack Cheese, Egg & Sausage and Egg with Vegetables & Pepper Jack Cheese. They are made with multi-grain flatbread and take 2 minutes to cook in the microwave from frozen. John can eat two in one sitting so I’m going to have to buy more than one box! Have you tried any of these new products from Kellogg’s? I tried the egg & pepper-jack cheese flatbread. Very good. I might have to try the morning shake now. Could use something to curb hunger. These look pretty good, although I wish the waffles were whole grain. We get new items in our stores very late here too, so I probably won’t be able to find any of them for a while. Those flatbread sandwiches look pretty good. I will have to pick some up. I haven’t tried any yet but I know my youngest would love the waffles! I am more of a home made kinda guy, I get it from my mom and grandma. I always think to myself that I was born during the wrong time period. I will have to get some of the shakes for my son. He is taking ADHD medication that causes him to not have much of an appetite so his doctor said we need to get him to drink shakes like this in the morning to maintain his weight. Thanks for the review! The flat bread sandwich looks great. I love that they have so many more options for breakfast now. Those flatbread sandwiches look really good! I like to have a variety of quick breakfast options on hand for those days when I’m running late or just don’t feel like making anything. I’ll definitely keep these in mind, especially the shakes. I don’t have young children, but I think the cinnamon waffles would be great for on the go, without any toppings!! The others look great, the shake would be a great late night snack! I will be on the lookout for the breakfast sandwiches … something hot is always good this time of year. I have tried the Special K breakfast sandwich and it is delicious! 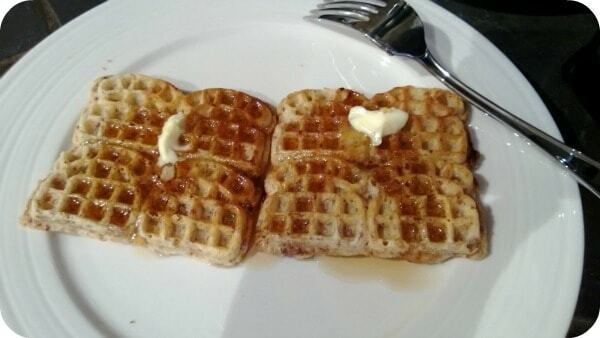 I also want to try the Mini Waffles they look delicious! Good to know! Those shakes look good and easy! I have not yet tried these products, but I like the idea of the flatbread sandwich. I am in love with the breakfast sandwiches! My favourite is the Egg and Sausage (which also has cheese on it). At 240 calories, it has less than half the calories of any fast food egg and sausage sandwich! It tastes good too! I love having them when I want a change from cereal! i love kellogg’s products. 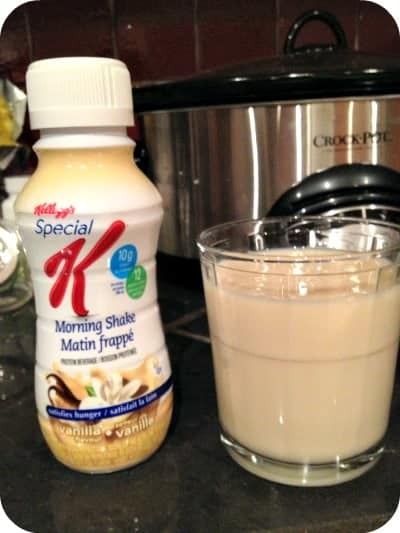 i would like to go on the special k challenge after having my baby. I’m waiting for some coupons to come in the mail to try these out. Hate spending $$ on something the kids and I may not eat. Mini waffles are so cute. Would be good for my Granddaughters. I have bought the Special K shakes for after a workout. Not too bad and a decent way to curb hunger. 🙂 I do like Special K products and am thinking I’d love to try the breakfast sandwiched. Yummy! I definitely want to try the Eggo Mini Waffles! They’d make a great treat for the kiddos. We had the Eggo minis this morning for the first time. They are AMAZING!! I also love the new shakes. I have been drinking them every morning for a week now. We have not tried the breakfast sandwiches yet, but we have a few boxes of them in the freezer. 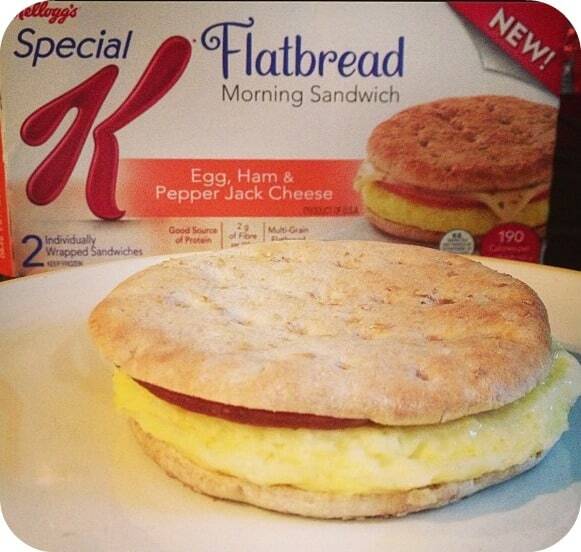 The Special K flatbread breakfast sandwiches look really yummy. I haven’t seen those before. I will have to check at the 2 different stores I like to shop at and see if they have them. We get up and get moving pretty quick in the am, these might be nice to try out. I haven’t tried any of the new products, but that flat bread breakfast sandwich is going on my next grocery list! The Eggo mini waffles sound good. Wow! The morning shakes look delicious! I love waffles so I’m gonna try those. These are SO POPULAR! I work for a major grocery chain and we just can’t keep them on the shelves! They are new to Canada though. We always get products later here it seems.